Commonly known as the golden chain, Laburnum x watereri 'Vossii' is a popular deciduous garden tree noted for its spectacular late-spring blooms, The watereri hybrid is both a naturally occurring and cultivated hybrid, the result of a cross between Laburnum alpinum and Laburnum anagyroides. It s named in honour of Waterers nurseries in Knaphill, Surrey where it was cultivated and first recorded in 1864. 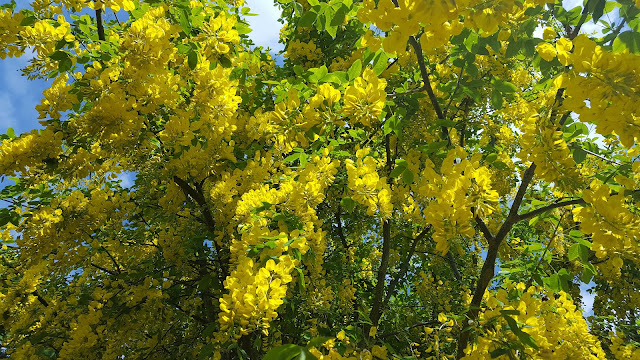 The 'Vossii' selection was raised in Holland late in the 19th century and has since superseded the older forms of Laburnum × watereri to become the most widely planted of all laburnum species and hybrids. The bright yellow, pea-like blooms are produced on free-flowering racemes are up to 60 cm in length, appearing from late April to mid-May. Laburnum x watereri 'Vossii' will perform best in a sunny position and planted in a well-drained soil. Avoid permanently wet, very heavy or waterlogged soils, otherwise improve the drainage or plant into a raised border. It can perform poorly in warmer climates and isn't recommended for use in Mediterranean or warmer countries. Even in the milder regions of southern England and Ireland it is recommended to provide some afternoon shade (although this isn't particularly practical) and the occasional deep watering during hot, dry summers. Laburnum x watereri 'Vossii' received the Award of Garden Merit from the Royal Horticultural Society in 1993. 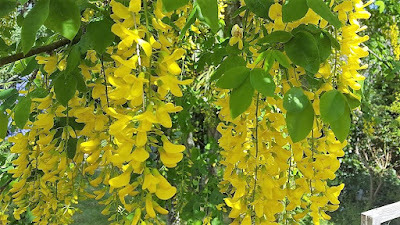 Note: Be aware that all parts of Laburnum x watereri 'Vossii' are poisonous. The main toxin in the plant is cytisine which can cause severe diarrhea, vomiting, frothing at the mouth, convulsions as well as intense sleepiness and even. Death is thankfully rare but not unheard of. The majority of incidents with Laburnum are related to the ingestion of the seeds which can be mistaken for the edible beans of Anagyris trees.